Right now, as part of a multi-million renovation to WSP, approximately 400 new benches comprised of ipê, a tropical hardwood logged from the Amazon rainforest, are being installed. Ipê has been—and apparently remains—the wood of choice for the tens of thousands of park benches throughout New York City. An extensive network of roads must be built to access the ipê tree, which is scattered throughout the Amazon at an average of 1 to 2 trees per acre. 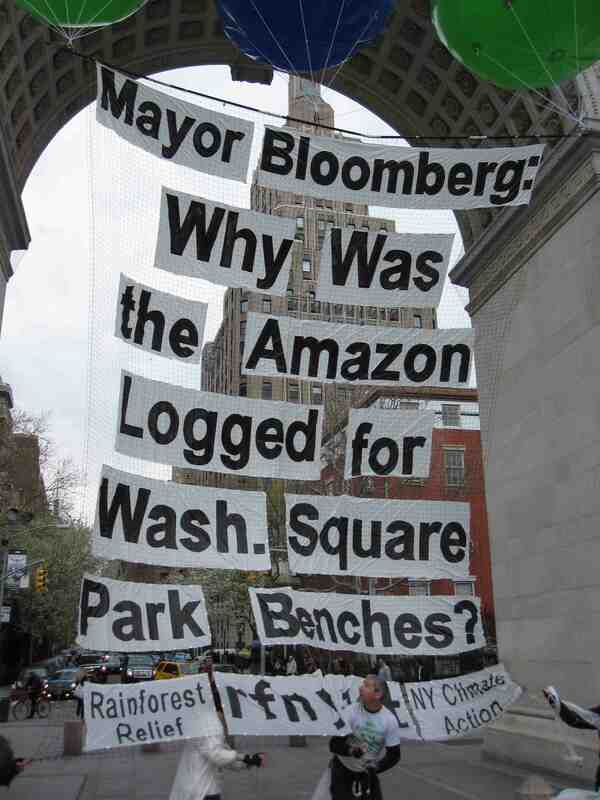 This ongoing use of ipê contradicts the pledge that Mayor Bloomberg made to United Nations General Assembly on February 11, 2008: “Our City’s agencies will immediately reduce their use of tropical hardwoods by 20%. 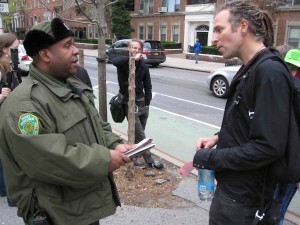 They will do that by specifying domestic wood, recycled plastic lumber, and other materials in the design of park benches and other construction projects.” He was following the lead of the Parks Department, which had declared an end to the use of tropical hardwoods for bench construction in late 2007. These parks, as well as many others, don’t just share their choice of wood in common. 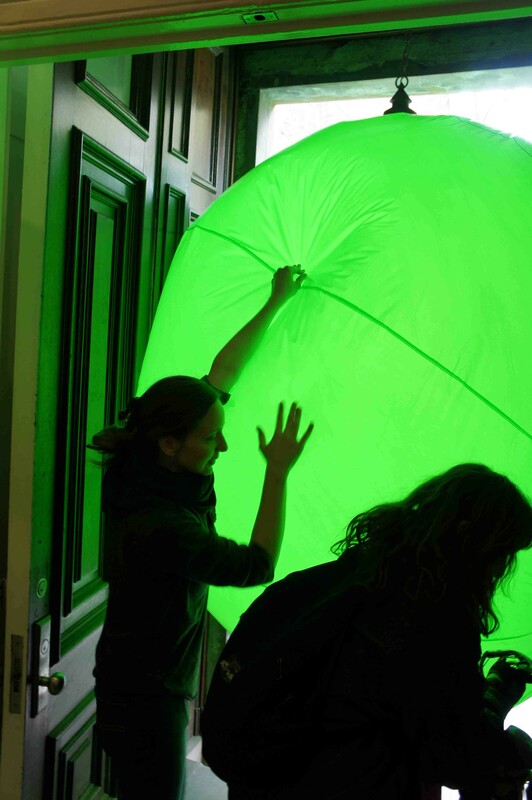 They are also part of a larger trend occurring throughout the city: duties and responsibilities concerning public space are largely being transferred from public agencies to private entities such as business improvement districts and public benefit corporations. These entities are assemblages of private investors and stakeholders who operate without public oversight. The Village Alliance, a business improvement district, had substantial sway concerning both the redesign of Washington Square Park as well as its maintenance. The same quasi-public, quasi-private ownership and decision-making process concerning design and maintenance has led to the use tropical hardwood for benches not just Washington Square Park, but also all of the above-mentioned parks. 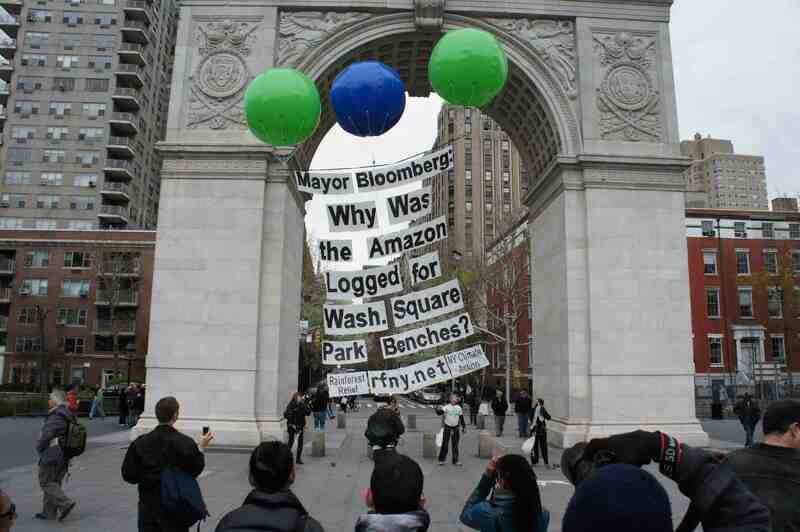 “The privatization of NYC’s public space is allowing the city’s destruction of the Amazon to continue unchallenged,” stated Tim Doody, the New York City campaign coordinator for Rainforest Relief. The question remains: how often is the Parks Department still making decisions regarding park design and the procurement of materials? And are private entities throughout the city now making an end run around guidelines established by a public agency? 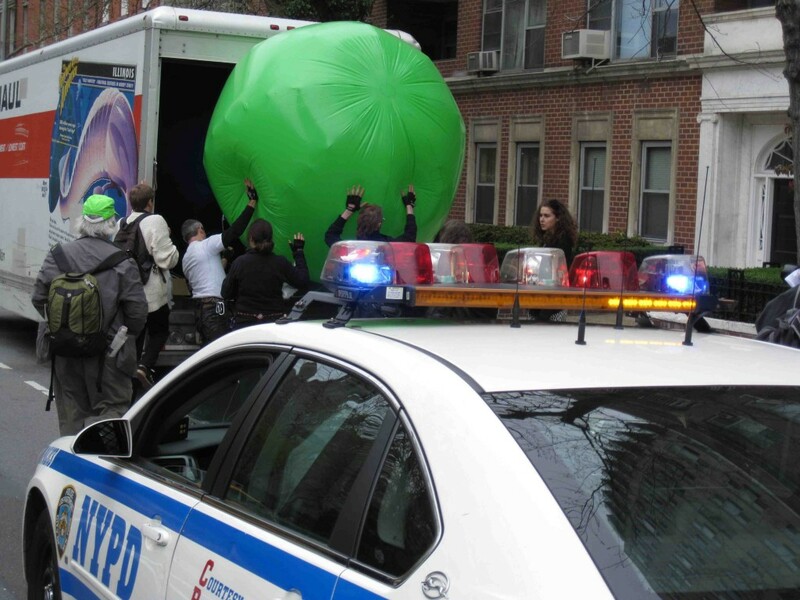 Whatever the answers are, there appears to be a breakdown in the statements coming from the offices of the Mayor and the Parks Department and what is happening on the ground in New York City. Just this month, the Department of City Planning, a public agency, and the Metropolitan Waterfront Alliance, a private entity, initiated “Vision 2020: the Comprehensive Waterfront Plan,” an ambitious undertaking to upgrade 520 miles of city waterfront with 50 acres of new parks, expand and enhance 10 existing parks, develop extensive greenways and 14 esplanades, upgrade marine terminals, and construct new piers and bulkheads for increased travel by commuter ferries and cargo ships. An official from the Department of City Planning, who asked to remain anonymous, indicated that tropical hardwood was being considered for the project. 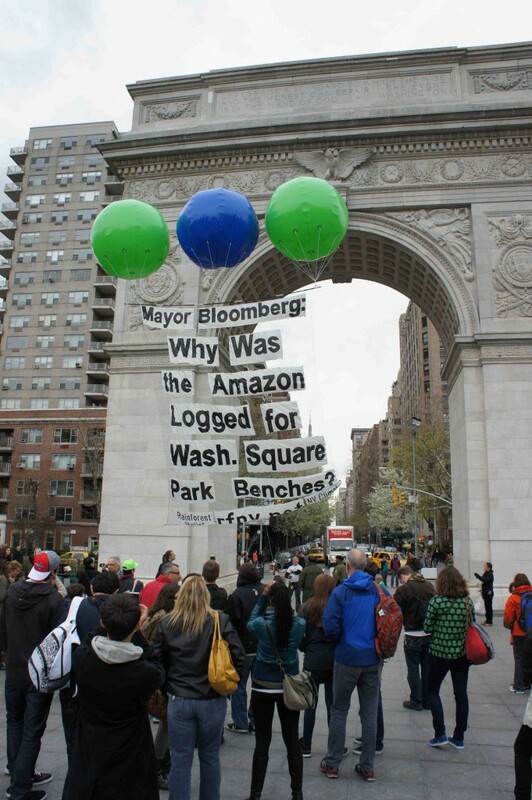 If the Department of City Planning and the Metropolitan Waterfront Alliance choose to use ipê or another tropical hardwood, this would very likely be the largest order of rainforest wood for public infrastructure in the history of New York City. “An area of rainforest the size of a football field is destroyed every second,” the UN Environment Programme states on its website. That’s an area the size of Manhattan every three hours. Before the United Nations General Assembly, Mayor Bloomberg eloquently reinforced his pledge to curtail the city’s use of tropical hardwoods. 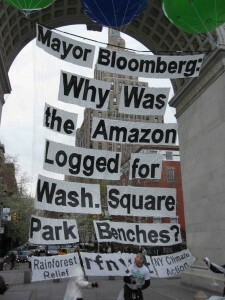 Today, as the world’s remaining rainforests continue to dwindle and the impacts of climate change increasingly manifest around the world, there is an immediate need for the Bloomberg administration to establish and enforce guidelines that will truly shut down the city’s use of tropical hardwoods for public infrastructure. 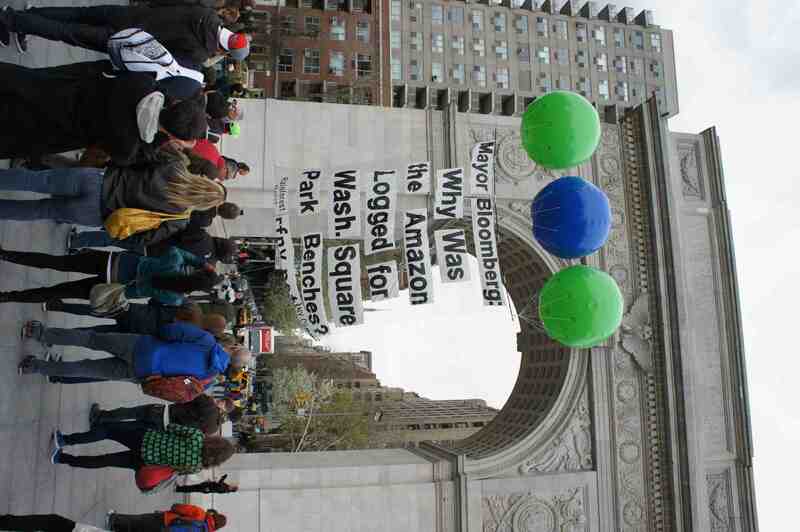 Two activists involved in floating the banner in Washington Square Park, Tim Keating and Tim Doody of Rainforest Relief, were charged with violations for “Failure to obey a lawful order” and charged $250 dollars a piece.